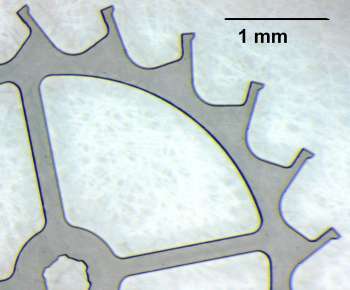 Due to the extreme hardness of diamond a mechanical cutting or sawing of the diamond wafers is not possible. For that reason a Q-switched Nd:YAG laser is applied for cutting them into desired shapes. After deposition, the coarse grained films are ground and polished to the desired thickness. For this purpose a high speed lapping machine capable of treating three samples simultaneously has been developed at Fraunhofer IAF. 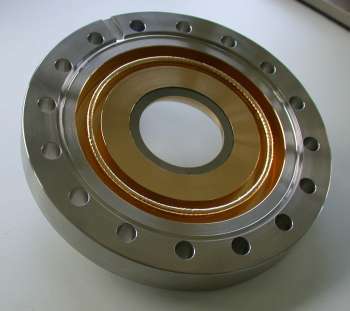 Diamond wafers with up to 5" in diameter can be polished. For the preparation of diamond heat-spreaders the metallization is of central importance. Various metallization schemes consisting of several metal layers have been developed. 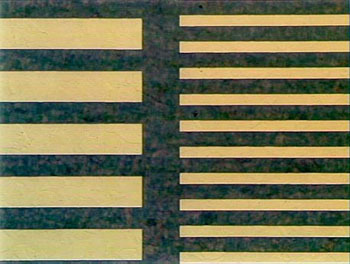 Each layer acts either as adhesion layer, diffusion barrier, or as surface layer improving the wetting behaviour of the solder. Thick gold layers are used as electrical conductors for high current densities. Soldering and brazing techniques are used e.g. to mount electronic devices on diamond heatspreaders or to prepare diamond-metal joints e.g. for the realization of UHV vacuum windows.